An undertaker in Polokwane, Kings and Queens, has distanced itself from a video of self-proclaimed prophet, Alph Lukau who claims to have resurrected a dead man. A vehicle belonging to the funeral parlour is seen on the video transporting a casket with the supposed dead man inside. 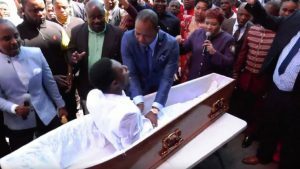 The man then awakens, gasping for air with Lukau announcing his resurrection to church members. The company’s managing director, Vivien Nethunzi, says they do not have any knowledge of the man in the video. The post Funeral parlour distances itself from “resurrection “story appeared first on SABC News – Breaking news, special reports, world, business, sport coverage of all South African current events. Africa's news leader..